This apron offers a sleek, clean look that will help create a sophisticated appearance at any upscale or casual restaurant, cafe, banquet, or catered event. 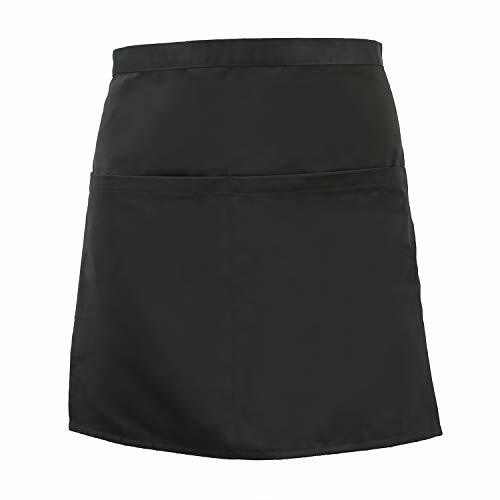 Waist Apron is made of 100% polyester material which brings a smooth touch. Looks stylish, lightweight, water-resistant as well as durable to keep you well from stains. 2 large sized front pockets and 2 small side pockets designed. Not only do the 4 sectional pockets allow room for table-hopping necessities like straws, pens, and guest checks, they leave your staff's hands free to carry multiple trays or wipe down tables, ensuring quick and efficient service. Serving: servers, waiters, decorators, etc. Cooking: Professional chefs, bartenders, helpers, etc. Cleaning: Dishwashers, workshop workers, car washers, etc. Arts andamp; Craft: Artist, carpenters, painters, etc. Our aprons hold checks, tips, receipts, order pads, straws, tools, gear and more!